The FCC has put the ARRL's January Petition for Rule Making (RM 11759) on public notice and invited interested parties to comment on what the League has called "minimal but necessary changes" to 80 and 75 meters. The ARRL petitioned the FCC to fix a "shortfall in available RTTY/data spectrum" that the Commission created when it reapportioned 80 and 75 meters 10 years ago. The League's petition asked the FCC to shift the boundary between the 80 meter RTTY/data subband and the 75 meter phone/image subband from 3600 kHz to 3650 kHz. The proposed change received strong support from ARRL members, and the ARRL Board of Directors adopted it as policy at its July 2015 meeting. At that time the Board also agreed to seek RTTY and data privileges for Novice and Technician licensees within their current 15 meter CW subband, and to do the same on 80 meters, depending on the outcome of the 80/75 meter subband revision. Modify the RTTY/data subband, so that it extends from 3500 kHz to 3650 kHz. Modify the phone/image subband, so that it extends from 3650 kHz to 4000 kHz. Make 3600-3650 kHz available for General and Advanced Class licensees, as was the case prior to 2006. Make 3600-3650 kHz available to Novice and Technician licensees for telegraphy -- consistent with existing rules permitting Novices and Technicians to operate CW in the 80, 40, and 15 meter General and Advanced RTTY/data subbands. Modify the rules governing automatically controlled digital stations (ACDS), to shift the ACDS segment from 3585-3600 kHz to 3600-3615 kHz, consistent with the IARU Region 1 and 2 band plans. According to the ARRL, the FCC Report and Order in Docket 04-140 released in 2006 departed substantially and without justification from the rules proposed in the FCC's so-called "Omnibus" Notice of Proposed Rule Making (NPRM), with respect to 75 and 80 meters. Among other actions, the resulting changes expanded voice privileges on additional frequencies in various bands, including 75 meters. The FCC shifted the phone/image subband from 3750-4000 kHz to 3600-4000 kHz, trimming the 80 meter RTTY/data subband from 3500-3750 kHz to 3500-3600 kHz and substantially changing "the entire dynamic of this band," the League said. Although the Omnibus R&O had indicated that incumbent licensees would not lose any operating privileges, some clearly did, the ARRL has pointed out. The most substantial adverse effect of the "unexpected and vast expansion" of the 75 meter phone/image subband, the League said, was the elimination of access to 3620-3635 kHz by ACDS. Read more. The ARRL Pacific, San Diego, and Louisiana Sections will get new Section Managers, and five incumbent SMs will begin new terms in their respective sections on April 1. The results of three contested elections in the winter election cycle were announced February 23, after ballots were tallied at ARRL Headquarters. In the Pacific Section, Joe Speroni, AH0A, received 228 votes, to 103 for Kimberly Fendt, WH6KIM. Speroni has been the Pacific Section's Affiliated Club Coordinator and maintains a variety of Amateur Radio-related interests. Outgoing Pacific Section Manager Bob Schneider, AH6J, decided not to run for another term after serving for the past 10 years, in addition to stints from 1992 to 1996 and from 2002 to 2004. In the San Diego Section, Dave Kaltenborn, N8KBC, outpolled Patrick Bunsold, WA6MHZ, 350 to 219 votes. Kaltenborn brings more than 25 years of experience as a radio amateur to the top post in San Diego Field Organization. He has been Assistant Section Manager, Assistant Section Emergency Coordinator, and a District and local Emergency Coordinator. Outgoing Section Manager Steve Early, AD6VI, decided not to run for another term after serving for the past 8 years. In the Louisiana Section, Scott Wren, KD5DFL, will succeed Jim Molan, KD5IGG, as Section Manager on April 1. Wren was the only nominee for the new term when Molan announced that he would not run for the position again after serving for one term. Wren has served as Section Emergency Coordinator for the past 2 years, and as an Assistant District Emergency Coordinator or Emergency Coordinator since 2005. In Virginia, incumbent Section Manager Joe Palsa, K3WRY, received 870 votes, while Anthony Harbour, KG4YXP, garnered 512 votes. Palsa was appointed as Virginia's SM 1 year ago, to complete the remaining term of then-Section Manager Carl Clements, W4CAC, who had stepped down. Now elected in his own right, Palsa will continue as Section Manager for the next 2 years. Four incumbent ARRL Section Managers faced no opposition and have been declared elected for new terms beginning on April 1: Pete Cecere, N2YJZ, Eastern New York; Joe Ames, W3JY, Eastern Pennsylvania; Karl Bowman, W4CHX, North Carolina, and Chris Stallkamp, W0ADZ, South Dakota. 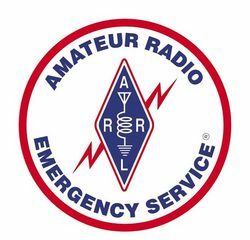 On Tuesday March 1, ARRL Headquarters staff will offer a free training webinar on three critical Amateur Radio Emergency Service (ARES) report forms. This webinar is intended for Emergency Coordinators, District Emergency Coordinators, Section Emergency Coordinators, Assistant ECs at all three levels, and Section Managers. The training will cover these forms:. Topics covered will include how to fill out the forms, who should complete the forms, where the information goes, how the information gets used, and why good reporting is critical. The future of ARES reporting will be discussed. The webinar will begin at 8 PM ET (0100 UTC) and last about 1 hour. Conducting the webinar will be ARRL Emergency Preparedness Manager Mike Corey, KI1U; ARRL Field Services Supervisor Steve Ewald, WV1X, and ARRL Emergency Preparedness Assistant Ken Bailey, K1FUG. Attendees may register online. For more information, contact Mike Corey, KI1U. AEC Jody Odem, NR9A, at the command post, explains the ARES team's activities to a local TV reporter. At the left is ARES team member Howard Dohack, W0JET. and the ARES team was tasked with patrolling the north levee. Gallup was familiar with the system of levees and earthen dams that keep the river from overflowing its banks. With only a handful of radio amateurs at hand, AEC Jody Odem, NR9A, said the ARES team soon realized it would have to expand its pool of volunteers to non-amateurs who would be willing to patrol the levee. He suggested providing Multi-Use Radio Service (MURS) VHF radios to support unlicensed levee walkers, supplementing ham radio and the Ste Genevieve County Amateur Radio Club repeater. 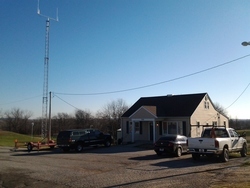 The Levee Watch Command Post at the Ste Genevieve Public Works Department office. The ARES team set up shop at the Ste Genevieve Public Works Department, which overlooks the Mississippi. A county-provided, trailer-mounted crank-up tower was pressed into service to mount antennas. Gallup's "go kit" was packed with a broad complement of radio gear. To obtain Internet service, Odem used a modified wireless router that could function as a repeater to borrow a wireless signal from a local residential care facility. As the patrols got under way, MURS radios were issued to all levee walkers, with one also going to the local police department to monitor the ARES team's traffic. The command post also monitored local law enforcement as well as county fire and EMS repeaters. Ste Genevieve County Emergency Coordinator Norm Gallup, KD0HHM, calling in an "area of concern" from the levee. While all this was going on, Odem's wife Ana, N0ANA, took to Facebook, e-mail, text message, and telephone to secure additional volunteers. Fortuitously, a ham, Don Pritchard, W6ZPC, is the news director and an on-air personality for the local radio station, and he was able to put out the word via that medium. "As the operation progressed, volunteers came out of the woodwork to walk the levee," Jody Odem said. Throughout the operation, a total of 37 volunteers walked 4-hour shifts on the levee, looking for "areas of concern," which were called in and plotted on a map using Google Earth. Many volunteers returned to walk multiple shifts, Jody Odem said, and even with temperatures dipping into the 20s at night, no one complained. None of the areas of concern that levee walkers spotted turned out to be significant, as the Mississippi River reached its second-highest level at Chester, Illinois, since records have been kept. The ARES team officially stood down on January 4. Read more. The FCC is seeking comments on a Petition for Rule Making (RM 11760) that asks the FCC to grant lifetime Amateur Radio licenses. 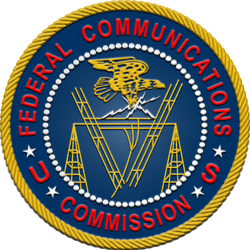 Mark F. Krotz, N7MK, of Mesa, Arizona, filed his request with the FCC last November. He wants the FCC to revise § 97.25 of its rules to indicate that Amateur Radio licenses are granted for the holder's lifetime, instead of for the current 10-year term. Krotz noted that the General Radiotelephone Operator License (GROL) already is issued on a lifetime basis, and he maintained that not having to renew licenses would lighten the FCC's workload. "It would be mutually beneficial for the FCC and Amateur Radio operators to update Part 97 to grant operator licenses for lifetime," Krotz said in his filing. "The FCC would benefit by reducing administrative costs." In 2014, the FCC granted lifetime credit for examination elements 3 and 4, but applicants seeking relicensing under that provision still must pass examination element 2. Individuals may submit comments via the FCC's Electronic Comment Filing System (ECFS). Since the creation of the Manhattan Project National Historic Site by the National Park Service (NPS) in mid-November 2015, activating one of the three sites comprising this unit has been impossible, in large part because gaining access to active Department of Energy sites is exceptionally difficult. The only site of the three with any hope of regular public access is Oak Ridge, Tennessee. On February 24, NPOTA administrators decided that any location within the boundaries of the Oak Ridge Reservation, as outlined on the NPS Manhattan Project website, will count for NPOTA credit. Activators must be sure not to transmit from private property without prior approval. There are 35 activations on the NPOTA Activations Calendar between February 25 and March 2, including Petroglyph National Monument in New Mexico, and Moore's Creek National Battlefield in North Carolina -- as part of the 240th anniversary celebration of the Battle of Moore's Creek Bridge during the Revolutionary War. Established less than 1 year ago, AMSAT's all-volunteer Phase 4 Ground Terminal team has made significant strides in developing an ensemble of solutions to support the so-called "Five and Dime" (5 GHz and 10 GHz) strategy AMSAT has embraced for microwave satellite projects. Prompting the effort is the planned launch of a geosynchronous military satellite in the 2018 time frame, which could play host to an Amateur Radio payload operating on the two microwave bands. The overarching project, which also includes a complementary Phase 4 Space team, is exploring new territory and innovative solutions, and it's seeking volunteers from among the technically savvy within the Amateur Radio community. Michelle Thompson, W5NYV, heads the Phase 4 Ground team. 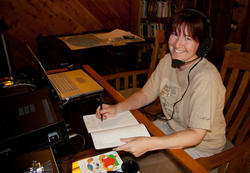 "We're going to make it as awesome as possible," Ground Station team lead Michelle Thompson, W5NYV, told ARRL. The project not only would support the Phase 4B geosynchronous launch, but provide solutions for the Phase 3E high-Earth orbit satellite, and receiver support for AMSAT's entry into the NASA Cube Quest Challenge, which would go to the moon. Thompson said the compelling technical reason for using 5 GHz and 10 GHz is the ability to use high-bandwidth modes on those bands. In addition, "the 5 and 10 GHz bands are popular elsewhere, and other projects are embracing this band complement," she noted. Another advantage would be to raise Amateur Radio's profile on the two bands and perhaps "shake things up" there for terrestrial use. "The 5 and 10 GHz bands are a compromise that's working really, really well," Thompson said. The US Air Force will control the geosynchronous satellite. Virginia Tech, Millennium Space Systems (MSS), FEMA, various clubs. as well as AMSAT and ARRL are partners in, or are supporting, the project. A formal memorandum of understanding is pending. Tinkering with a DVB-S2X signal in the laboratory. "We're currently exploring the Amateur Radio implementation of a very advanced and exciting open standard called DVB-S2X for the downlink," Thompson explained, noting it offers a variety of modulation and coding. Earth stations will use their individual radios, transmitting a digital signal -- probably something called Offset QPSK (O-PSK) -- directly to the satellite, with each getting its own channel in a frequency division, multiple access (FDMA) scheme. "This is an elegant way to design an efficient and advanced communication system and allows technical volunteers to experiment with the basics of cognitive radio -- radio that can sense the environment and adapt to take full advantage of the capabilities the hardware offers," she said. Groundsats and a "Big Honking SDR"
Phase 4 radios will be designed to work not just with the impending geosynchronous satellite but through terrestrial microwave "Groundsats," which, Thompson said, "are essentially satellite simulators that let you test and use the radio terrestrially." Phase 4 radio designs also could be configured to use modulation schemes that are better able to deal with terrestrial multipath. Ground Team member Paul Williamson, KB5MU, with a HackRF One SDR board, being evaluated for use as a Phase 4 Ground radio. Amateur Radio Access Points (ARAPs) -- essentially signal aggregators -- would allow legacy radios, FM handheld transceivers, or emergency traffic providers to use the satellite from any point where an ARAP can be deployed, packaging the input for uplink to the satellite. Hams within ARAP range would be able to use the Five and Dime terrestrial network just as if they were operating through a satellite. "The Groundsat, which is doing the same job as the satellite payload, has a big honking SDR on it," Thompson said. Groundsat equipment has arrived and is in use in San Diego, North Texas, and at Virginia Tech, and Groundsat development is under way at those sites. A fourth site would be at Morgan State University in Maryland. The name "Five and Dime" also reflects the project's economics. AMSAT Board Member and Virginia Tech Research Professor Bob McGwier, N4HY, recently explained on the AMSAT-BB that the Ground Team's work is "an effort to design an inexpensive ground terminal for amateurs that would cost tens of thousands of dollars commercially, for as much under $1000 as we can get it." 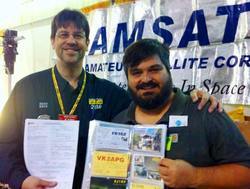 To volunteer for the Phase 4 Ground Team, provide your contact information on AMSAT's Engineering Team contact form. Read more. It took nearly 20 years, but AMSAT Vice President of Operations Drew Glasbrenner, KO4MA, finally qualified for Satellite DXCC. Glasbrenner submitted the requisite number of QSLs for checking at the Orlando HamCation February 12-14, and ARRL Media and Public Relations Manager Sean Kutzko, KX9X, verified KO4MA's achievement. "It's been a long process getting to satellite DXCC," said Glasbrenner, who got into satellite operating around 1993, and was only on RS-12 (Mode K) for a long time. "This was the Russian satellite payload that used 15 meters up, and 10 meters down." Glasbrenner's activity stagnated for a long time during and after his college years, but in 1999 he got involved in working the LEO satellites, such as UO-14, AO-27, FO-20, FO-29, and AO-10 "when it was still semi-usable," he added. ARRL Media and Public Relations Manager Sean Kutzko, KX9X, and AMSAT Vice President of Operations Drew Glasbrenner, KO4MA, at the Orlando HamCation. "When AO-40 was launched into a high-Earth orbit, I dove into Mode U/S with gusto," Glasbrenner recounted. During the 3 years that AO-40 was active, he spent many late nights and early mornings looking for the next new one. 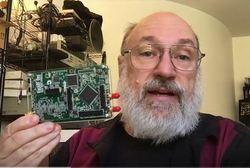 "Eventually I was using a 3-foot solid dish with preamp and downconverter for the Mode S downlink, and this is when some of my most exciting contacts came." Highlights included working VU2MKP at a few degrees of elevation to the east, right after the satellite came up, and working KH2GR in the other direction. When AO-40 went silent, Glasbrenner said he was about a dozen short of DXCC, and he realized that he'd have to be proactive to finish up with just LEO satellites. Many of his new ones came from operators who went the extra mile to operate from places like the Caribbean and Greenland. Glasbrenner said the absence of operational HEO satellites "makes satellite DXCC nearly impossible for newer operators." Bernhard Dobler, DJ5MN, has been at the top of the DXCC Satellite standings since 2000, and has 274 entities confirmed. Read more. The computer hardware/software/do-it-yourself blog Hackaday has profiled Rufus Turner, W3LF (ex-K6AI) -- believed to be the first African-American radio amateur and one of the more fascinating personalities in US history. Born on December 25, 1907, in Houston, Texas, Turner "became fascinated by crystal diodes and published his first article about radio when he was 17," according to Hackaday. He went on to build what Hackaday described as "then the world's smallest radio set" in 1925, while still a teenager. In the day when radio amateurs still were allowed to broadcast, W3LF became the first radio station licensed to an African-American. He broadcast with a 15 W in Washington, DC, and operated another radio station for his church. Working with Sylvania in the 1940s, Turner helped to develop the 1N34A germanium diode. And in 1949, he wrote "Build a Transistor" for Hugo Gernsback's Radio-Electronics magazine (May 1949 issue, p 38) -- at a time when transistors (aka "crystal triodes") not only were cutting edge but not commercially available. His meticulously described project involved the sacrifice of two 1N34A diodes. In January 1950, his article, "A Crystal Receiver with Transistor Amplifier" appeared in Radio and Television News, along with plans for a three-transistor radio. This was in the days before such things had begun to appear on the market. A veteran of the Hurricane Watch Net (HWN) and the Maritime Mobile Service Network (MMSN), Capt David Lefavour, W7GOX, of Los Lunas, New Mexico, died on February 8. He was 82. 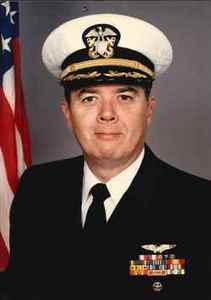 Lefavour served for more than 28 years in the US Navy as a fighter pilot and later worked in law enforcement. An ARRL member, he was a member of the HWN for more than 20 years, serving as the net manager from 2006 until 2009 and receiving manager emeritus status in 2013. He also was a net controller for a similar tenure for the MMSN. "Dave was one of few I've met who had a very calming and reassuring voice during any emergency situation," HWN Net Manager Bobby Graves, KB5HAV, said. Lefavour will be interred at Arlington National Cemetery with full military honors. February 27-28 Maintenance to Interrupt ARRL Website Services: The ARRL Information Technology Department will conduct overnight maintenance on its network during the February 27-28 weekend, and some or all website systems and services will be temporarily unavailable. The work will start at 0100 UTC on February 28 (the evening of Saturday, February 27, in US time zones) and be completed by 1100 UTC on Sunday, February 28. The ARRL website will remain up, but online processing of membership applications and renewals and the ARRL Store will not be available. E-mail also will be unavailable, but all messages will be queued for later delivery. We apologize for any inconvenience. "Ham Radio Now" Hosting 2015 ARRL/TAPR Digital Communications Conference Video Presentations: Full-length video of all major presentations at the 2015 ARRL/TAPR Digital Communications Conference (DCC) is now online, courtesy of "Ham Radio Now." This includes the 16 individual talks on subjects ranging from making a WSPR transmitter from a Raspberry Pi to advances in HF receiver testing to building your own networked satellite ground station. Each talk runs about 45 minutes. The DCC Sunday "Deep Dive" -- 4 hours on a single topic --covered 3D modeling for Amateur Radio. Saturday night banquet speaker ARRL Contributing Editor Ward Silver, N0AX, posed the question: "Ham Radio... Now What?" DCC videos are grouped in a YouTube Playlist. Idaho QSO Party Listing in QST "Contest Calendar" Contains Incorrect Website URL: The March "Contest Calendar" listing for the Idaho QSO Party contains an incorrect URL for the sponsor's website. The correct URL is http://idahoarrl.info/qsoparty/rules.htm. The Idaho QSO Party takes place March 12-13, 2016. Tad Cook, K7RA, Seattle, reports: Over the 7 days of our reporting week (February 18-24), average daily sunspot numbers declined from 56.7 to 37.9. Average daily solar flux was down from 107.8 to 93.9, but geomagnetic indicators were also down (generally a good thing), with the average planetary A index decreasing from 17.7 to 10.1 and the average mid-latitude A index declining from 12.6 to 7.3. The latest prediction from the US Air Force has solar flux at 85 on February 25-26; 80 on February 27-28; 85 on February 29; 90 on March 1-2; 105 on March 3; 115 on March 4-7; 110 on March 8-9; 105 on March 10-13; 100 on March 14-15; 95 on March 16-19; 100 and 105 on March 20-21, and 110 on March 22-23. Solar flux then peaks at 115 on March 29 through April 3. Predicted planetary A index is 8 on February 25-29; 12 on March 1; 8 on March 2-4; 5, 15, 10, and 8 on March 5-8; 5 on March 9-10; then 8, 5, and 12 on March 11-13; 30 on March 14-16; 15 and 8 on March 17-18, and 5 on March 19-21. Sunspot numbers for February 18 through 24 were 35, 42, 46, 47, 29, 27, and 39, with a mean of 37.9. The 10.7 centimeter flux was 94.9, 94, 100, 95.6, 93.7, 91, and 87.9, with a mean of 93.9. Estimated planetary A indices were 29, 15, 6, 4, 4, 6, and 7, with a mean of 10.1. Estimated mid-latitude A indices were 20, 10, 5, 3, 3, 5, and 5, with a mean of 12.6.